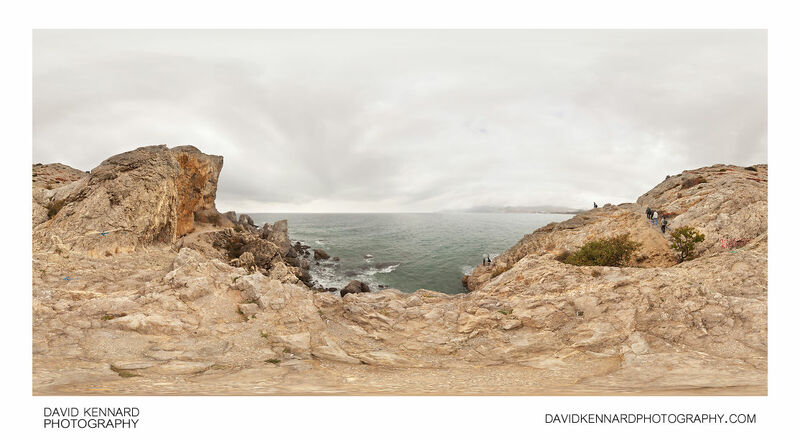 360° panorama from the trail around Alchak, near Sudak, Crimea. Cape Alchak (Мыс Алчак; Mis Alchak), also known as Mount Alchak (Гора Алчак; Goda Alchak) is a small mountain located to the south-east of Sudak. Its name comes from Crimean Tartar and means 'low', a suitable name with the mountain's peak being 152 metres above sea level. Fishing from the rocks of Alchak is a popular pastime, in this image several fishermen can be seen. Also visible is the Devil's Bridge (Чертов мостик; Chertov Mostik), a small wooden bridge that crosses a shallow but steep precipice. The name comes not from the current bridge, but rather the previous bridge, which consisted of an iron wire.